We recommend regular checkups and preventative care for both adults and children. A routine check up will cover, in addition to searching for tooth decay; your jaw joints, bite, signs of infection, gum disease or oral cancer. We will offer personalised advice on how to care for your teeth at home including brushing, floss and interdental brushes. Your input into your own oral health is invaluable! These are formed when minerals in saliva combine with plaque and it becomes hard. Once formed, it can only be removed by a dentist or hygienist. Approximately 6,800 people are diagnosed with mouth cancer each year in the UK. 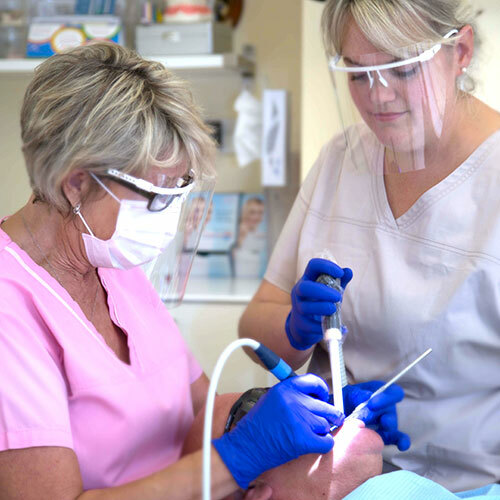 Our dentists routinely assess mouth, gum and tooth health as part of the normal check up to flag any issues early on. Identifying potential gum disease is paramount to ensure that teeth hygiene and treatment is tailored to avoid future longer term, more serious, tooth and gum health issues. Periodontal disease can be tackled through hygienist visits at Wargrave Dental Clinic, and your own maintenance of your oral health. This is often the first sign of periodontal disease that is noticed by patients. Bleeding gums are generally caused by poor oral hygiene. Leaving plaque on your teeth and gums cause the gums to become inflamed and cause bleeding. If bleeding is noticed you will need to brush all surfaces of your teeth, to include in between your teeth, thoroughly and efficiently. Bleeding is the sign of infection and inflammation. The end result is absence of bleeding, once you are given the correct tools and instructions by our hygienist or dentist. The combination of diet and oral hygiene plays a huge part in oral health, preventing gum and tooth disease and decay. Avoiding sugary foods, excess red wine and staining coffee and tea, combined with regular flossing and brushing could be all that is needed keep your teeth and gums healthy. Our hygienist can supplement your good work to help you keep your teeth white and smiling. Smoking and tobacco use can cause stained teeth, bad breath, a diminished sense of taste, mouth cancer and affect your immune system. This lowered immune system is associated with periodontal disease. Wargrave Dental Clinic will encourage and motivate you through regular check-ups and advise on behavioural to help you focus on the healthy, whiter teeth you will have over time after quitting. Please see www.smokefreelifeberkshire.com for more advice. Playing contact sports can lead to tooth injury. Wearing a bespoke custom made mouth guard from us will secure and support your jaw joints when unexpected force is applied. They are comfortable to wear but remain in place so you can focus on the game ahead. After seeing Gail, I had an extremely positive experience. Gentle, very thorough and she explained very clearly how I can improve my dental cleaning..